Interstate 270 angles northwest from Interstate 70 by the Stapleton community in Denver through Commerce City and Interstate 25 by a commerce park area in southern Adams County. The freeway serves commuters west to Westminster and Boulder via connections with U.S. 36 and northeast Denver and Aurora beyond the east end with I-70. 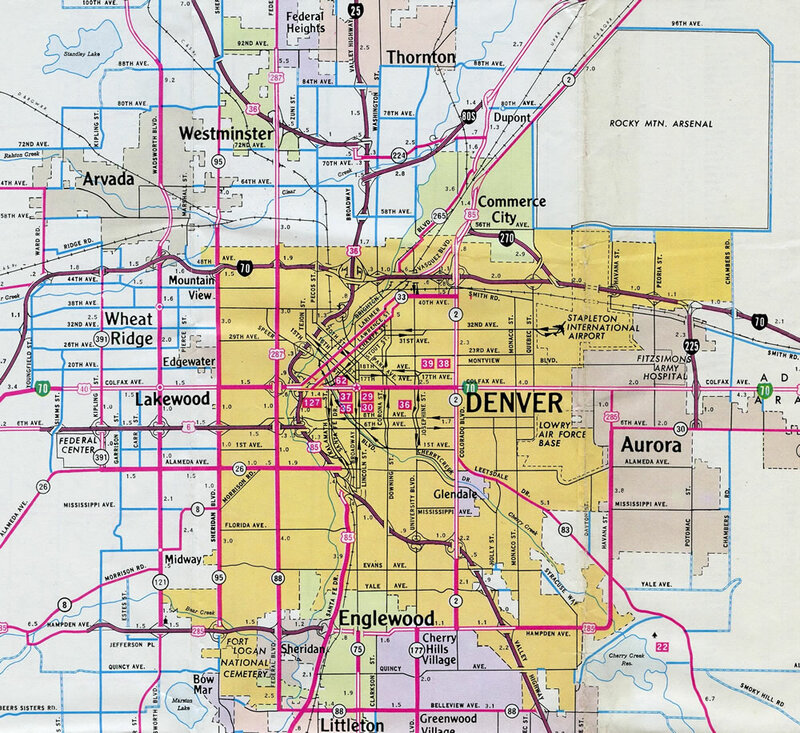 On April 7, 2000, the Route Numbering subcommittee of AASHTO approved the extension of Interstate 270 from I-76 northwest to I-25. The freeway accommodates six lanes of traffic between I-25 and I-76, and just four southeast to I-70. Together with Interstate 76 west to Arvada and Wheat Ridge, I-270 provides a bypass of the oldest section of Interstate 70 through north Denver. 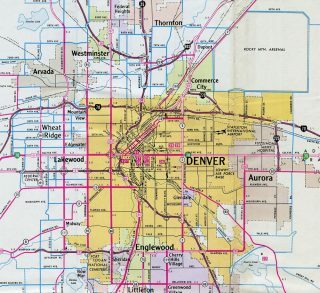 Short segments of Interstates 80S, 225 and 270 were opened to traffic across the Denver metropolitan area by 1968. The original configuration of Interstate 270 in 1986. Exit numbers along the freeway remain unchanged today, despite the addition of one mile. Interstate 270 converges with Interstate 70 east at a wye interchange in the Stapleton area of northeast Denver. Exit 5 separates from the ending freeway for Central Park Boulevard. Photo taken 08/11/16. An end Interstate 270 shield stands above the departing off-ramp (Exit 279) from I-70 east to Central Park Boulevard. Photo taken 08/11/16. Two lanes of traffic merge onto Interstate 70 east below Central Park Boulevard. The exchange opened here in October 2011. Central Park Boulevard serves the residential redevelopment of what was Stapleton International Airport. Photo taken 08/11/16. Nearing the merge point with Interstate 70 east on I-270 prior to construction of the Central Park Boulevard interchange. Motorists continuing east meet Havana Street in industrial areas of Stapleton at Exit 280. Photo taken by Dale Sanderson (04/01). 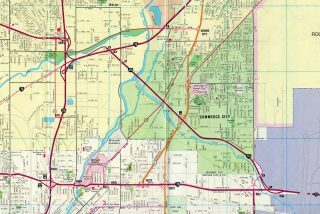 What was previously the 0.75 mile approach to Interstate 270 west is now the location where Exit 279A departs for the freeway west to I-25 and U.S. 36. Construction of Central Park Boulevard (Exit 279B) changed the traffic pattern by 2011. Photo taken 02/02. Westbound Interstate 70 at the original split with I-270 and hidden U.S. 36 at what was Exit 279. Traffic to I-270 west now combines with an on-ramp from Central Park Boulevard before turning north below Quebec Street (former Colorado 35). Photo taken by Dale Sanderson (04/01). Interstate 270 west connects with I-25 north two miles west of the Colorado 265 (Brighton Boulevard) underpass. There is no direct connection to I-25 south; insteads motorists are directed onto I-76 west for its ramp to Denver. Photo taken 04/22/17. Interstate 270 leaves Commerce City across the South Platte River to meet Interstate 76 (Exit 1). The freeway was extended west from here to Interstate 25 (Exit 0) in 2000. Photo taken 04/22/17. All traffic to Interstate 76 departs from I-270 in unison at Exit 1. 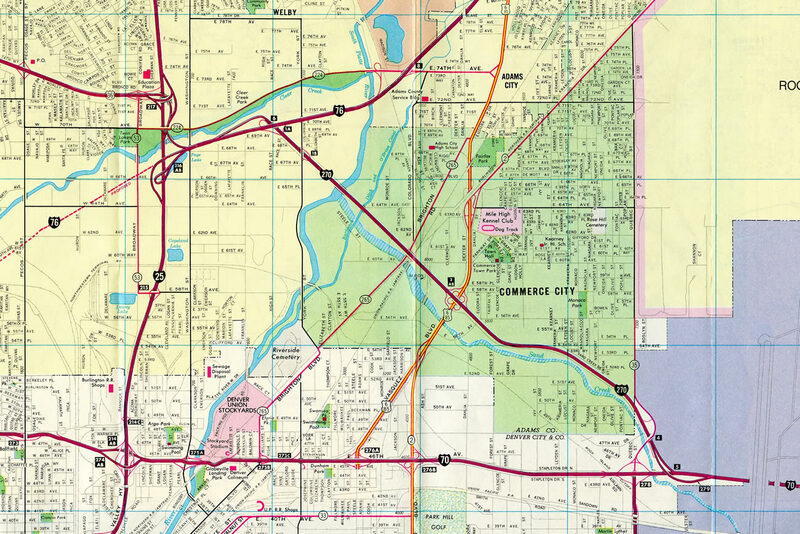 The freeway mainline advances west 1.25 miles to the northbound ramp for Fort Collins and Cheyenne, Wyoming. Photo taken 08/11/16. Completion of Interstate 270 west in 2000 provided a seamless link for U.S. 36 west onto the Denver-Boulder Turnpike. Prior to this connection, U.S. 36 navigated west on I-76 and north on I-25 to continue northwest to Boulder. Photo taken by Dale Sanderson (04/01). U.S. 36 emerges from its hidden overlap with I-270 at the systems interchange with Interstate 25. The Boulder-Denver Turnpike takes U.S. 36 northwest to Westminster, Broomfield, Louisville and Superior. Photo taken 08/11/16. CDOT inventories only one route on implied concurrences. The mileage of U.S. 36 from Strasburg west along I-70, and Denver northwest along I-270, is factored into the mileage of Interstate highway. The Denver-Boulder Turnpike is a part of Route 036B, which is the second independent stretch of U.S. 36 inventoried in the state. Photo taken by Dale Sanderson (04/01). U.S. 36 (Denver-Boulder Turnpike) east becomes Interstate 270 east at the junction with Interstate 25. A begin shield appears as Exit 0 loops onto I-25 north toward Fort Collins. Photo taken 08/11/16. Until March 2002, Interstate 270 began from Interstate 76 at Exit 6. Work at the former trumpet interchange between the two freeways continued through August 2003. Photo taken by Dale Sanderson (04/01). Approaching Interstate 270 and U.S. 36 on I-76 westbound. Signs still referenced the western extension of I-270 as a Future route. Photo taken 02/02. Summers, Stephen “Interstate Numbering AASHTO and FHWA.” Online posting. April 18, 2003. news misc.transport.road. Interstate 270 – 50th Anniversary of the Interstate System. Colorado Department of Transportation (CDOT). Page updated May 12, 2017.